Talent, reputation and strong communication skills go a long way to winning clients, but it’s also important to make sure that your freelancing business reflects a strong brand. Remarkably, many freelancers don’t brand their own freelancing business. This is a mistake because your potential clients will form quick impressions about you and your business. Branding reflects how others perceive you and your freelancing business. The most successful designers and writers – including those who work on crowdSPRING – have taken the time to think about their freelancing businesses, to create strong logos, upload strong avatars (that we display to potential buyers), write great copy in their profiles, and otherwise build a strong brand outside of crowdSPRING – on their own personal sites and elsewhere. Clients do notice. Here are several tips to keep in mind as you develop your brand. A strong name is easily recognizable and is important to good branding. The dilemma for many freelancers is whether to name their business after themselves, or come up with another name. Using your own name is of course, easiest – and if your name carries some credibility in your circles, perhaps most effective. On the other hand, using your own name does have some disadvantages – some clients might perceive you as less professional and less serious about your design or writing business. Some names also are much more difficult to spell or pronounce. This is especially important if you’re looking for freelancing work internationally. Today, it’s difficult to find a good name and an available domain; many short names have already been taken). However, plenty of successful brands have proven that there are many different ways to create a good name. For example, many successful brands use real words (Adobe, Amazon, Apple, Yelp), some use misspelled words (Google), compounds (Facebook, Firefox, WordPress), phrases (LinkedIn, SecondLife) and other variations. 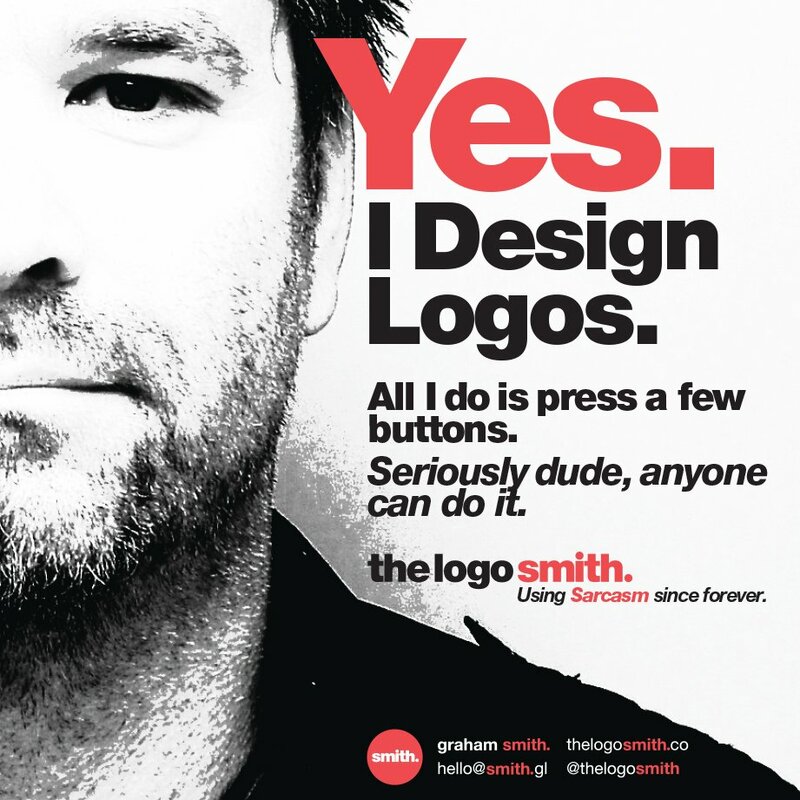 One of my favorite freelance brands is Graham Smith’s “thelogosmith“. If you’re interested in more examples – especially if you’re struggling to find a name for your company – I recommend you read this post about naming your company. What do you hope to accomplish with your freelancing business? What do your customers and potential customers currently think of you/your business? What do you want your customers to think when they think of your business? The above questions are important not only for selecting a strong company name, but also for selecting a strong logo. As designers know, the logo is an important element of a brand. As you think about your logo, keep your audience and products/services in mind because you want your logo to reflect your business. A good logo builds trust and a strong logo will help to pull your brand together.Think about the branding of some of the world’s most admired freelance designers as you consider how you can pull your own brand together. Some freelancers and freelancing businesses mistakenly modify their brand message depending on their audience (or short-change certain audiences altogether). For example, a business might take a more serious tone on their website but a very lighthearted tone on Twitter. This approach is ultimately ineffective. To build and maintain a strong brand, every aspect of your brand should be as good as your service and you must be consistent in presenting your brand to prospects and customers. This includes not only your business’s name, logo, overall aesthetic design, but also includes your marketing materials, website, business cards, deliverables, etc. Brand consistency requires attention to detail. Successful brands communicate in a consistent voice across all mediums, have a consistent look to their communications and use collateral materials that support their brand messaging. For example, when you deliver proofs in a project on crowdSPRING, do you use a proof template that also includes your own brand? Why should you care about brand consistency? You should care because brand consistency leads to familiarity, and familiarity leads to trust. It’s impossible to build long term relationships with clients and potential clients unless you build trust with them. A brand is more than just your services. It’s also the ecosystem that surrounds those services. Ultimately, the strength of a brand is directly related to the connections within that ecosystem. Your brand starts with your business and if the business employs others, its employees. Your brand extends to your vendors, and even competitors. It extends to people that start conversations about your brand on Twitter or Facebook, or who blog about your brand on their blogs. One way to think about your ecosystem is to identify the participants in your brand ecosystem. Who are they? What can those participants give and get in order to help your brand? Ultimately, successful brands recognize that if they help their participants succeed, the participants will in turn help the brand succeed. Successful freelancers are very good and disciplined in understanding and communicating their value proposition to prospects and customers. Value doesn’t mean lowest price – nor does it mean empty promises that you’re the best. You can focus on product leadership (having the best products in the marketplace, like Apple), operational excellence (having the lower prices in the marketplace, like Ikea), or great customer service (Virgin, Amazon). You can also focus on a combination of those things – although this is not easy to achieve, especially for a young brand (such as a freelancer just starting out). As you think about your freelancing business’s value – you can ask the following questions: What sets your services and freelancing business apart from your competitors? What value do you provide and how does that value differ from that provided by your competitors? Think about which of your benefits are emotional – the most powerful brands tap into emotions. Do you have questions or other suggestions about branding a freelancing business? We’d love to hear from you in the comments below.